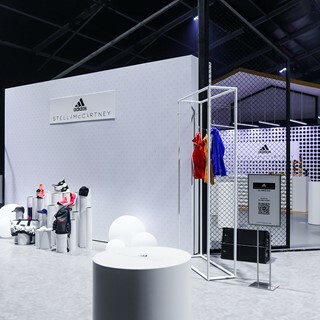 Herzogenaurach, August 15th 2018: adidas by Stella McCartney today showcases its Fall/Winter 2018 collection in an immersive, 4D fitness event set to bring to life the new season’s message of power. Through this first of its kind experience, the brand shows that style and sustainability can combine to deliver cutting-edge technology. The Fall/Winter 2018 collection will feature as part of the virtual reality activation, part of a wider ambition to bring fitness trends from other cities to women around the world – without making an impact to the environment. This season the outdoor running culture of Paris will be transported to the vibrant capital city of Shanghai as guests discover adidas by Stella McCartney’s pledge to produce less waste and less emissions as it lowers its own carbon footprint. Ming Xi, adidas by Stella McCartney’s new global face, is this year’s Fitness Exchange highlight. Together with attendees, Ming will test the style, comfort and performance of the garments in a high impact, multi-sensory, fitness experience that transports her virtually from the busy streets of Shanghai to the crisp and cool treelined avenues of Paris. Pounding her feet to the bleating of birds and a simulated breeze, this futuristic workoutof sound, light and colour, will allow Ming to trace her tracks back to the city where her modelling career started. The event, open to media and influencers, will allow versatile female athletes to immerse themselves in the outdoor running culture celebrated in the city of lights without increasing their carbon footprint.